Cycle racks are available adjacent to the building. The nearest station is Newcastle Central (around three hours to London King's Cross, one and a half hours to Edinburgh). If you arrive into Newcastle Central Station you can choose to either: 1. Catch the yellow Quaylink Q1 bus from outside Central Station (about fifteen minutes). 2. Walk across the Swing Bridge from Central Station (about fifteen minutes). (See Google Map below) 3. Take a taxi (about eight minutes). From the A1(M) / A1: Take the exit signposted (from the South) Gateshead and Newcastle (Centre) A184 or (from the North) Gateshead A184. Keep in the left-hand lane of A184 signposted Gateshead town centre. At roundabout, take third exit, signposted Gateshead town centre. Go straight through two sets of traffic lights. Get into the right hand lane to go straight over at a third set of lights. At the fourth set of lights, turn left onto Oakwellgate and immediately right under the railway bridge up the steep slope into our car park, or second right to the drop-off point, or blue badge parking. From Newcastle Centre: From the Tyne Bridge, go through the pedestrian traffic lights, under the railway bridge and straight across the next traffic lights. At the next lights, take the left signed Gateshead Quays and East Gateshead (NOT the loop signed Consett or Metro Centre). At the first lights with Mecca Bingo on your right, turn left onto Oakwellgate. Stay in the right hand lane under the railway bridge and take first right into our car park or second right to the drop-off point or blue badge parking. From the Swing Bridge: Go straight up Bridge Street, which turns into Cannon Street: as the road bears round to the right, go left for the drop-off point or blue badge parking or follow the road right into Oakwellgate and take the first left to our car park just before the railway bridge. There is a drop-off and collection point at the west door of Sage Gateshead. We offer a free phone at Coats Desk which connects you directly with the taxi company. The Quaylink bus is a handy way to explore Newcastle and Gateshead Quayside including Sage Gateshead. The buses run up to every 15 minutes during the day and every 30 minutes in the evening For some Sage One evening classical concerts, we provide a dedicated service on two routes: 1. Hexham and Corbridge 2. Alnwick and Morpeth via Felton Tickets cost £8 return and should be booked in advance on 0191 443 4661. Newcastle coach station is operated by National Express and is situated at St James' Boulevard just a ten minute walk from the Metro at Central Station. Sage Gateshead has its own car park with lift access situated directly behind the building. 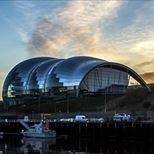 (Please note Mill Road car park, situated at the bottom of the steps near the Millennium Bridge, is not operated by Sage Gateshead). Up to 30 minutes: FREE - go straight to the exit with your ticket. Up to 1 hour: £1.90 Up to 2 hours: £3.50 3 hours or more: £4.80 - Pre-payment required before entering the building. If you are staying for 3 hours or more and pre-payment is not made, then an hourly rate of £1.90 will apply to your visit. Pre-payment charges will cover until 6am the following day, at which point an hourly rate of £1.90 will apply. Assistance Dogs are welcome at our venue, without any additional charge, subject to production of a valid identification document from Assistance Dog (UK) or equivalent international organisation. A separate ticket is not required, however we ask customers to inform our team prior to the day of the event so that any necessary arrangements can be made.